Environment: Operating Temperature: 0 ? ~ 40 ? Storage temperature: -40 ? ~ 70 ? 【11N Wireless Technology】: The wireless speed and range to power a complex set of networking applications to create a highly efficient mobile office or entertainment network. 【Function】: WR150N can scan two-dimensional code into the phone setting interface, including Repeater Mode, Router Mode, AP Mode. Compatible with any wireless network, router and Wi-Fi enabled devices including smartphone, iPad, tablet, laptop, desktop, smart TV, etc. 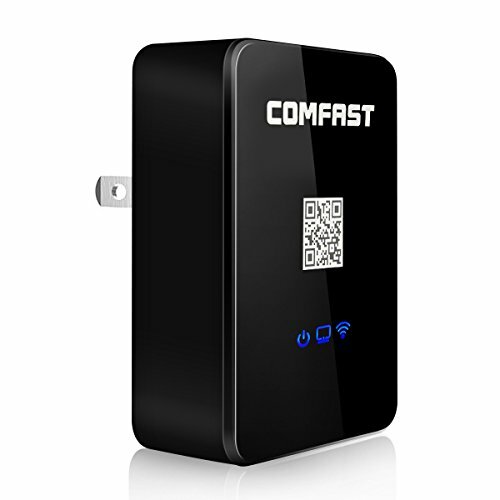 【Extend Home Wifi to Full Coverage】: WiFi up to 150Mpbs achieves the signal coverage of 150m2, the signal coverage can be extended, leaving no network signal dead zone, but the WiFi signal will not be enhanced. 【Exquisite Appearance】: Along with the characteristics of compact, use-small size and wall-mounted design make it easy to deploy and move with flexibility. 【Key Relay】: First press the WPS button and then released after 1-2 seconds to complete the pairing, fully compatible with Win XP/Vista/7/8/10.